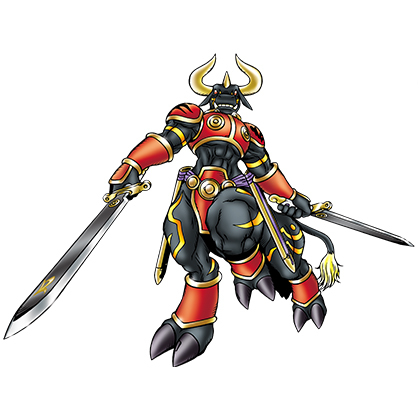 Difference between revisions of "Vajramon"
One of the "Deva Digimon", it is a Perfect Digimon with a form resembling the Ox. 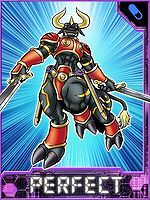 As a follower of the Four Holy Beasts Digimon Xuanwumon, it is a seeker of truth who is aiming for detachment from material and emotional concerns. Its warrior-like personality values honor, and loathes cowardice and effeminacy. With the most well-tempered physical strength among the Deva, it can easily wield its giant twin Bǎo Jiàn that it carries on its waist. Its Special Move is using its forefeet and upper body to strike the ground with its twin Bǎo Jiàn, generating fissures that extend up to 50 m before it (Rodha). Rocks are also hurled out from the shock waves as they erupt from underground, inflicting damage on those nearby. 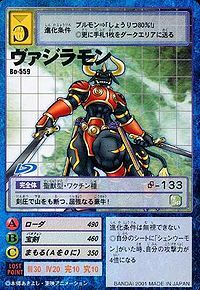 | Vajra (「ヴァジラ」 Vajira) is one of the Twelve Heavenly Warriors of Buddhist Mythology. Vajramon with Pajramon arrive to Real World, Vajramon tries to convince Renamon to come back to the Digital World, but Renamon evolves to Taomon and defeats Vajramon. Several Vajramon were residents of Sword Zone. 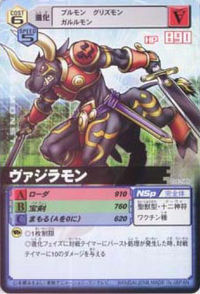 Vajramon can only be obtained as a collectible card. 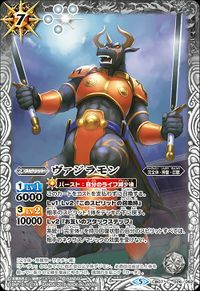 Its card is part of the Deva (十二神将（デーヴァ） Jūnishinshou (Dēva)) set and the Xuanwumon's Subordinates (シェンウーモン配下 Shen'ūmon Haika) set. 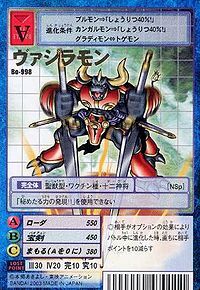 Vajramon is available as a Digimon Card. Vajramon is available as a Digimon Medal. This demon-horned seeker of truth splits the earth with one strike of its treasure swords! 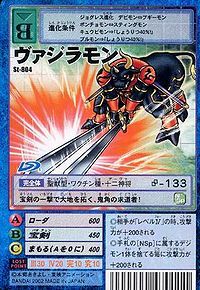 The pressure from this strong, sturdy bull's swords slices through even mountains! 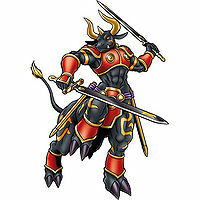 One of the "Deva", it is a Perfect Digimon with a form resembling the Ox. Its Special Move is using its forefeet and upper body to strike the ground with its twin Bǎo Jiàn, generating fissures before it (Rodha). ↑ Internet Sacred Text Archive, retrieved 08/31/07; Vishnu Purana, Ch. VI: "He who causes abortion, plunders a town, kills a cow, or strangles a man, goes to the Rodha hell (or that of obstruction)." 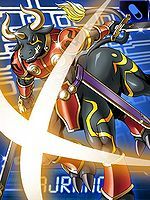 ↑ Digimon Tamers: "Duel with the Deva"